Salmon fly fishing, Spey casting with a double handed rod, a floating line and a small fly, observing the Atlantic salmon rise to the fly is the epitome of fly fishing. A growing number of anglers prefer fly-fishing to all other forms of fishing. 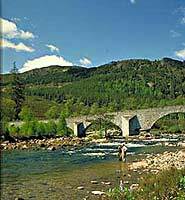 In Scotland there is such a variety of rivers that no matter what type of fly-fishing tackle you have there is a place to use it. On the bigger rivers there is plenty room and many of the regular anglers resort to using rods between 16 and 18 feet, particularly during spring or high water conditions. At these times it is often necessary to use sinking lines to conquer the fast flows and get the fly down to the required depths. To lift and cast sinking lines a fairly strong rod is necessary. Sinking lines type 2, 3 and 4 are used according to the water depth and flow. In such conditions tube flies are an ideal choice and a selection including Willie Gunn, Black & Yellow, Black & Orange and Garry Dog, preferably with the options of black or silver bodies and in varying weights and lengths between one and three inches cover most situations. During normal conditions or as the ideal "all round" salmon fly rod, a 15-footer capable of fishing a selection of sinking and floating lines and suitable for Spey Casting is the perfect choice for medium to large rivers. On smaller waters a 13-foot or 14-foot rod is a more comfortable choice. During low water summer conditions, a single-handed rod suitable for a #7 (or heavier) line will cope admirably with most situations. A reliable reel well filled with at least 100m of 30-pound BS backing is advisable for salmon fishing. In good fly-fishing conditions a choice of sink tip, an intermediate or floating line is helpful. Attaching a sinking leader to a floating line is common practice to prevent fly skate. From late spring until autumn most fishing is practiced with dressed flies. A selection of Ally´s Shrimps, Yellow Ally´s Cascade, Munro Killer, Executioner, Silver Stoats Tail, Stoats Tail, Arndilly Fancy, GP and Tosh together with a few Irish Shrimps in sizes 4 down to 12 will cover most situations. In very low water, small plastic micro tubes fished on light tackle sometimes provide the only means of attracting fish from the slower flows. View or buy a superb range of Ally's salmon shrimp flies or hairwings.